Both the Kindle Fire HD 7" and Kindle Fire HD 8.9" feature stunning HD display which gives us perfect movie entertainment experience. However, the same as other tablets, DVD is not supported by the Kindle Fire HD (Fire HDX and Fire HD Kids Edition). To get your favorite DVD movies onto the Amazon tablet, you need to convert DVD to Kindle Fire HD supported video formats like MP4. 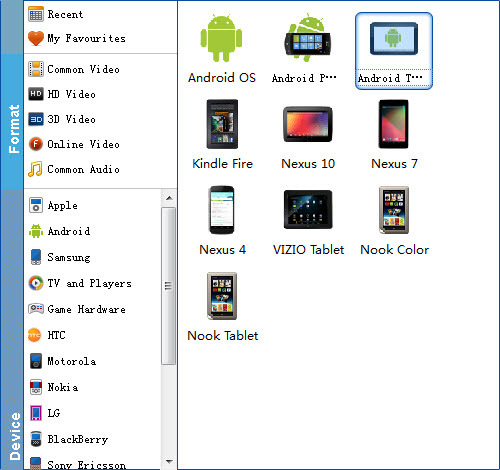 Below is a quick-start guide on how to transfer movie DVD to Kindle Fire HD for smoothly playback. To get the work done effortlessly, here EaseFab DVD Ripper is highly recommended. The intuitive DVD converter can easily convert DVD to Kindle Fire HD MP4 so that you can enjoy any DVD movies on your Kindle Fire HD on the move. In addition, this DVD ripping tool can also convert DVD and ISO files to MP4, AVI, WMV, MPEG, MOV, FLV, MKV, 3GP, etc. as well as rip DVD to optimized video for playback on iPad, iPod, iPhone, Zune, Creative Zen, Archos, iRiver, Blackberry, Xbox 360 and more. Now download the program and follow the tips below to finish your task. This below guide uses the Windows (Windows 8 included) version screenshots. Next, select a proper output video format. Luckily, this DVD converter provides the video profile for Kindle Fire HD so you don't need to be bothered by what format to set as the output file format. By choosing Kindle Fire, you'll convert your DVD movies to videos with optimized settings to fit Kindle Fire HD, Fire HDX and Fire HD Kids Edition. Tips: If you're not satisfied with the result videos. You can click the Settings button beside Profile to set bitrate, frame rate, codec, channels, sample rate, etc to adjust parameters that affect video quality and file size for the video you prefer. After that, you can click on "Add to My Favourites" to rename the profile, such as "Kindle Fire HD". Next time, you can easily find it in "My Favourites" category. After all necessary settings, simply click the big Convert button to start converting the added DVD files to Kindle Fire HD compatible videos. Wait for the conversion to complete and click Open to get the converted videos instantly. After that, transfer them to your Kindle Fire HD and watch them anywhere you go. Just enjoy your movies!